In the mid 1970s I first came across the poems of Han Shan, or "Cold Mountain," the Zen/Taoist hermit of the T'ang Dynasty. Burton Watson had translated 100 of the approximately 400 extant poems. Later, in 1984, in conjunction with my computer composition, Night Sky Scroll, I reread the poems and found more translations by Gary Snyder, Arthur Waley, and others scattered throughout the literature. 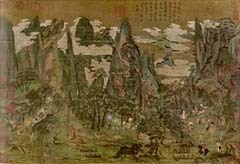 Night Sky Scroll was inspired in part by Han Shan, whose dual nature as enlightened being and eccentric recluse accords with the character of that composition. I consequently developed a taste for Chinese Buddhist poetry resulting in my song cycle, Wang River Cycle (1986), based on translations of poems by another famous poet of the T'ang, Wang Wei. When the complete poems of Han Shan were published in 1990, translated by Red Pine, my interest in setting Buddhist poetry was rekindled. Due to my previous studies, I knew how much is transformed in translating Chinese poetry into English. Not only is the rhyme and tone scheme totally lost, but the connotations and allusions that drive a "Recent Style" poem articulated by single (usually monosyllabic) words have to be fleshed out into prosy phrases. Thus, translated poems have a very different feel from their sources. My answer to this problem was to learn enough Chinese to do a translation myself, but not with the aim of making an English poem. Rather, I would be producing a text to be sung, rather than read. So in the Winter of 1993, I learned a bit of classical Chinese and read up on T'ang dynasty lyric theory. In the end, I was surprized that my translations turned out to be somewhat readable, if hardly as elegant as the experts. In this connection, I am grateful for the help of Su Yin Mak, a graduate student in Music Theory and Musicology at the Eastman School of Music. She took an interest in my project and helped me through the night of translating Chinese. A particular problem was to set these poems for soprano, rather than for a man. While most of the poems do not reflect gender, I was obliged explicitly to change Han Shan into a woman in the domestic scenes of "Home" and "A Dream." The gender change helps enliven Han Shan and puts a new spin on the poems "Girls Playing" and "A Critic." I felt justified in this transformation since the Indian Mahayana Buddhist "Avalokitesvara," a male bodhisattva, when imported to China in the first millennium AD ended up as the female "Kwan Yin," the bodhisattva of compassion. In addition, when a person has become enlightened, he/she takes his name from the immediate locale, usually a mountain. These enlightenment names suggest that an enlightened person, male or female, is totally fused with his/her environment; this symbolizes the unity of personal ego with the "universal mind." The form and arrangement of my translation--fourteen poems interspersed with five piano interludes--was designed to provide a picture of Han Shan in his/her many guises and disguises. The opening poem presents her/him to the uninitiated--alien to the outsider's concern. After a brief piano interlude, we hear from Han Shan himself. We learn that she can be both laconic and effusive. In either style he is direct, totally at one with the moment. Another piano interlude leads to three poems, describing the three stages of Han Shan's life: her youth as an indigent scholar and householder; his separation from his family; her later years after enlightenment. The next poem is the longest, set off by interludes. Its first verse describes the enlightened person as an empty, open house. The second verse is addressed to the unenlightened outsider concerned with getting ahead in mundane affairs. The next five poems form a group. Each presents a different manifestation of Han Shan's personality/environment modulated by the concerns and intensions of those who seek her/him/it: "dark and eery," "no one there," "picking flowers," "struggling," "hostile," and so on. The last of the five poems ("A Critic") documents an ironic exchange, the only poem in which Han Shan actually talks with an ordinary person. The closing two poems return to Han Shan's world, a response to his enlightenment and its outcome: "the world is space." Cold Mountain Songs was completed in May of 1993.